It was a wonderful weekend at Randolph as we celebrated Family Weekend, Homecoming, and Leadership Council. This massive, combined series of events was attended by alumnae and alumni, current students, prospective students and their families, faculty and staff, and friends of the College. This race, run by students in the Sport and Spectacle class, is a recreation of the race once run by teams of Athenian citizens during the Panathenaic Festival. Don’t miss this cookout with students, families, and College alumnae and alumni. Enjoy food, a variety of beverages (cash bar), and music while sharing stories to remember! Dinner is available for purchase for families, alumnae and alumni, guests, faculty, and staff. Live music and RandolphConnect activity begin at 5:30 p.m.
Take a stroll through Caldwell Commons to see posters and presentations of student research and other collaborative research that current students have conducted with Randolph College faculty. The Career Development Center will be on hand to help you connect today’s experiences with tomorrow’s opportunities. 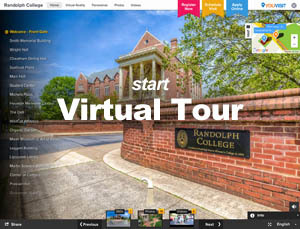 Study Abroad will also be available to share all the different options available to Randolph College students. Vice President for Academic Affairs and Dean of the College, Carl Girelli, invites you to enjoy brunch (available for purchase), while taking the opportunity to meet with a faculty member from each academic department and program. Stop by Cheatham Dining Hall and meet College Chaplain Rev. Jennifer Vestal Moore and learn more about spiritual life opportunities available to students on campus and in the Lynchburg community. At 12:45 p.m., following the open house, Chaplain Moore will offer a tour of Houston Memorial Chapel, starting on the Bell Quad side of the dining hall. Buy a chance to swing for the fence and support your softball team. All are welcome! Winner announced at half-time of the women’s soccer game. Join a 30-minute group tour of the museum beginning at 2 p.m. or 2:30 p.m.
Dr. Peter Sheldon will discuss and demonstrate why cats land on their feet and other related things you might have wondered about. Join alumnae and alumni, students, families, and friends for an afternoon of fun. The Homecoming Tailgate includes food trucks, a beer garden featuring WildCat punch, a corn hole tournament, all overlooking our beautiful WildCat Stadium. Carl Girelli, vice president for academic affairs and dean of the College, will share information about the exciting new academic programs offered at the College. These new programs include a Masters in Fine Arts in Creative Writing through a low residency program, a Museum and Heritage Studies Major, Summer Research Program, online courses ranging in topics from communication studies to physics, and a Common Experience Program for first-year students.